On my many walks up the side of the mountain that leads to Beyoglu, I sometimes become plumb tuckered by the time I get to the Galata Tower. A respite is in order and I often find refuge at Enginar, a chi chi tapas bar with a nice patio featuring a commanding view of Star Bufe and the Fureya Fish House. On my first visit I make acquaintance with my waiter, Turan, a nice Armenian fellow and as I rest up over a couple or 5 Raki we discuss the events of the day and what, perchance, the evening may offer. 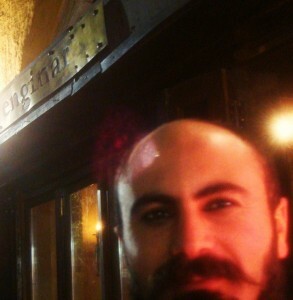 As Enginar closes he invites me up to his apartment in nearby Neverland hostel. As we make our way down some truly byzantine alleys he informs me “I wouldn’t normally go this way but for some reason I feel safe”. He senses the double tough ranch hand in me I inwardly reckon as we enter the hostel. An hour or so later the party is in full swing with a group of Greeks, a Spaniard, a Wisconsinite and myself. These events repeat themselves a couple more times over the course of my vacation, always with Enginar as the springboard. I never manage to try the food but as far as libations go the Raki is fine. They offer American spirits as well as Miller Lite [!] but the surcharge for such frivolity is usurious to put it mildly. On a chill Winter’s day an afternoon spent nicely bundled on the patio at Enginar with a tumbler of Raki is a fine way to while away a few hours. I generally like my saloons a little more rough and tumble but for a fancy joint Enginar ends up being one of my favorite hangs.